GENEVA, May 24, 2012 – Iomega International, a wholly owned subsidiary of Iomega Corporation, an EMC company (NYSE:EMC) and a leading innovator in data storage solutions for small and medium businesses (SMBs), today announced the addition of a new distribution partner, Anixter, a market leader within the video surveillance/security industry, to service video surveillance needs in parts of Europe, Middle East and Africa (EMEA). Anixter leverages its technical expertise and sophisticated supply chain management as a value added distributor in support of security integrators, and will now team up with Iomega to bring Iomega’s award-winning StorCenter™ network storage products into the growing SMB and distributed enterprise video surveillance markets. “We are excited to include the Iomega server class network attached storage devices to our security portfolio. The addition of Iomega’s products will add an additional layer to our IP Video Surveillance Solution offering to our customers” said Steven Anson, Anixter’s Vice President Marketing – Enterprise Cabling & Security Solutions for EMEA. “At Iomega, we are looking forward to working with Anixter to bring cost-effective Iomega StorCenter network storage devices to SMBs and distributed enterprises throughout Europe and other parts of EMEA,” said Jan Jensen, Vice President of Sales, EMEA, Iomega Corporation. “Iomega network storage devices are the network storage of choice in multiple video surveillance storage management solutions coming to market. Iomega network storage products that will be offered in video surveillance network storage solutions include the double-drive desktop Iomega® StorCenter™ ix2-200 Cloud Edition NAS unit, which ships with up to 6TB* of networked storage capacity, the four-drive desktop Iomega® StorCenter™ ix4-200d Cloud Edition, with up to 12TB* of storage capacity, and the new four- and six-drive desktop Iomega® StorCenter™ px4-300d and px6-300d models, with up to 18TB* of storage. 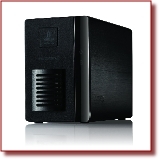 There are also rackmount StorCenter models that offer up to 38TB of storage capacity. All of Iomega’s StorCenter NAS devices utilize the acclaimed EMC LifeLine™ software, a fully-developed Linux operating environment compatible with video surveillance management solutions such as the Axis Video Hosting Service (AVHS), jointly developed by Iomega with Axis Communications. Additionally, Iomega StorCenter devices carry a three-year warranty with registration. For more information on Iomega's complete line of storage products, including current pricing for all StorCenter models, please go to www.iomega.com or contact your local Anixter representative. Anixter, Inc., a wholly owned subsidiary of Anixter International, is a leading global distributor of communication and security products, electrical and electronic wire & cable, fasteners and other small parts. The company adds value to the distribution process by providing its customers access to 1) innovative inventory management programs; 2) more than 450,000 products and over $1.0 billion in inventory; 3) 225 warehouses with approximately 7 million square feet of space; and 4) locations in over 260 cities in more than 50 countries. Founded in 1957 and headquartered near Chicago, Anixter trades on The New York Stock Exchange under the symbol AXE.